For eye protection or fashion you're pet deserves the very best! Doggles offer 100% UV protection! Whether you're best friend accompanies you on a motorcycle ride, hangs their head out of the car, loves to sunbathe or is sensitive to light Doggles will be sure to keep their peepers safe! 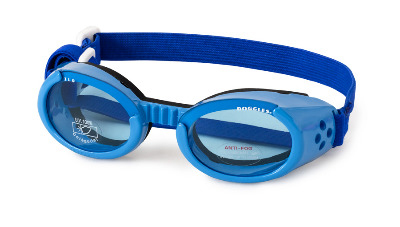 You can rest assured that they are safe and they'll love the extra attention wearing Doggles will get them! Polycarbonate (shatterproof), anti-fog, 100% UV protection lenses. Elastic adjustable straps - head and chin. Foam lines frame for extra comfort. Extra deep lens cup keeps the lenses away from the eyes.